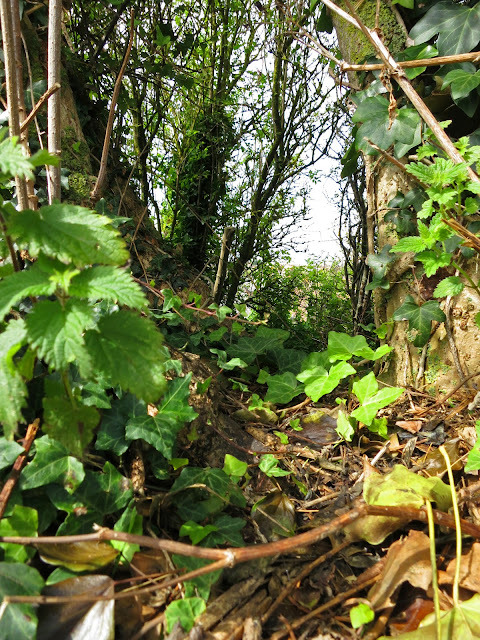 LOOSE AND LEAFY in DORSET: WHO STOLE MY LEAF? Narrow path between elder trees. the first in this series of elder posts. 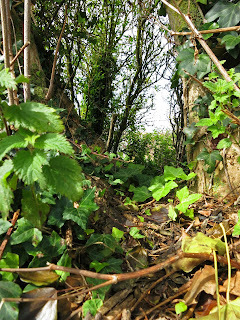 There are several of us bloggers who feel a bit disrupted when the council cuts verges along paths and roads. A few years ago, there was a specially deep and distressing hack-back, just when it was almost the moment to go blackberrying. It hasn't been too troubling since then. Vipers bugloss and chicory plants tend to be affected so the grassy edges of a route I often follow are less dramatic, less blue than they used to be - but the trees are kept trim without being splintered and torn; people can walk or cycle without being grabbed by brambles. It has to be done. Until recently, the undergrowth (mainly consisting of alexanders and nettles) has been growing tall between me and my elder tree. (The 'my' meaning the one I've been following since leaves first showed their buds.) At times, it's been awkward. I've had to zoom in over the top to photograph 'my' particular leaf. And there have been irritations too - of all the leaves on the tree, 'mine' decided to be the smallest, the least grown, the runt for all that it started well. And now? Between going on holiday and returning, the council has been by and shaved things back. Elderberries which were ripening when I went have been cut off or shaken from their stems. And, strangely, despite having grown in the protective crook of a bough, the leaf I was following has gone, along with its brothers and sisters. Bits of wood are broken. 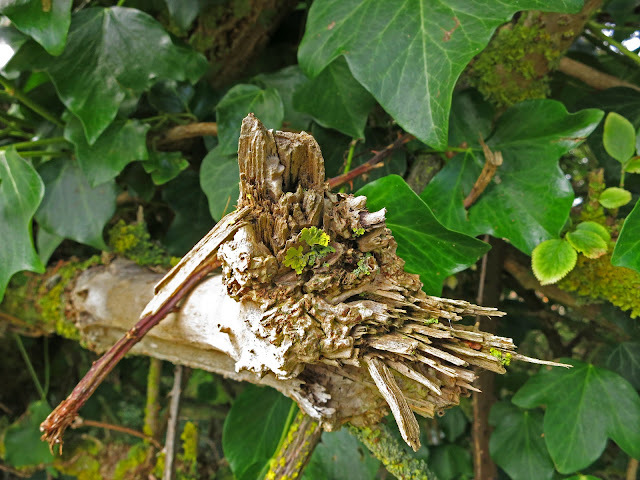 Ivy leaf pierced by twig. Gatekeeper (Pyronia tithonus) butterfly on blade of grass. 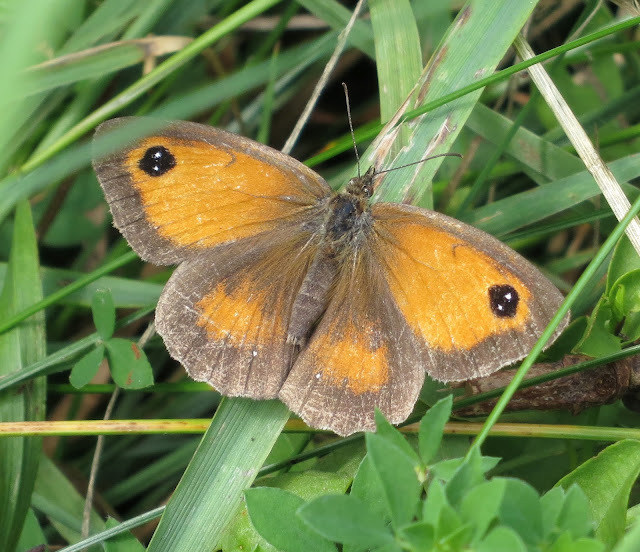 a Gatekeeper Butterfly in the grass. 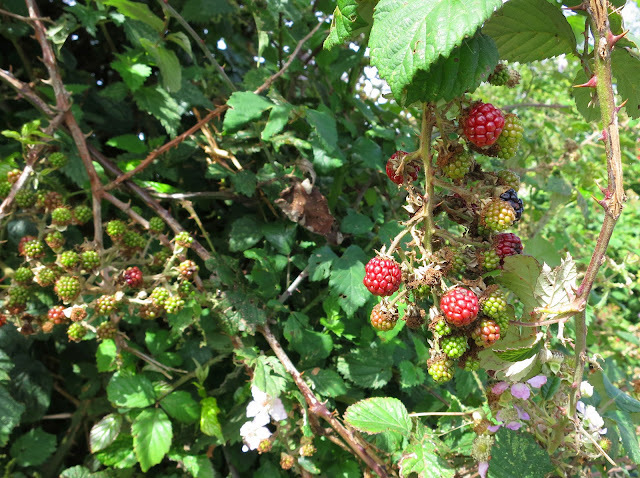 And blackberries too. Some have had their stems cut so the fruits have withered and dried but there are still masses ripening - not very ripe yet but there! Attention will need to shift to them. They are looped over 'my' tree, even if 'my' tree is a little depleted! is included in the list of 'Tree Followers' at the top of the blog. P.S. You may like this sequence of 20 pictures of some of the world's most beautiful trees. Oh I understand how you feel, we have this kinship with plants, and want to see them move onto the next cycle. It's hard when that is disturbed. I understand too. Here, they hack at trees along the roadways, and beneath power lines. I wish we could convince them to take a little care with their work, but I don't think that's going to happen. 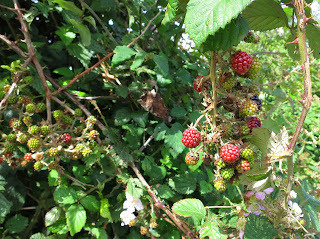 the blackberries are a bit sad around here, your lucky to find some plump ones. I hope we have some sun in September to make them ripe. How sad that your tree and its leaf have been vandalised by the council hedge trimmers. Lovely to see the gatekeeper moving in though. Sadly I can see more of this rather destructive cutting back. I was reading a story just yesterday about contractors cutting the verge on a busy road here in Leeds at 2AM. Much wildlife survives in cities because of verges and the like but no the company want to save money by not doing any traffic control. Apart from waking people up, which is how the story made the national press, more than one person has commented that they cannot do a decent job in the darkness. What a dreadful shame the council have been along and cut everything back. I hate seeing them do this! I must do a post about my tree too. I have still been following it but haven't done a post for ages. Your Gatekeeper butterfly picture is fantastic. Hello Foxglove Lane - Glad you like the idea of tree following. Do let me know if you do a tree following post - and I'll put a link from here. Hello Jen at Muddy Boot Dreams - It was startling to arrive expecting something in particular - and finding an absence instead. Hello Flighty - Glad you like the butterfly. I've only recently begun to identify what's what. Hi, Dee. I'm glad we don't have to worry about snakes when brambling! Care - that's the point! 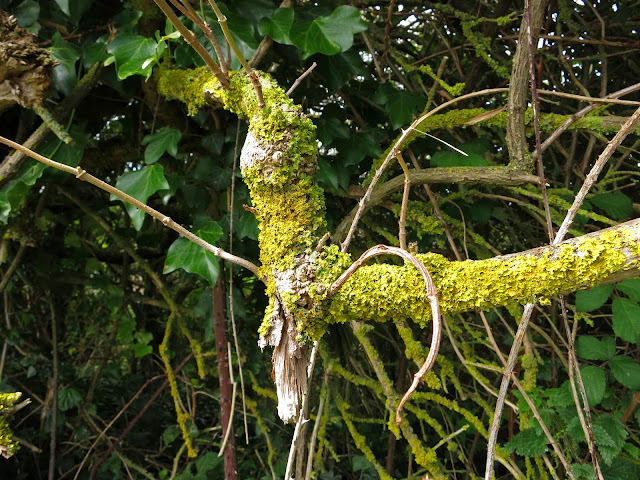 Undergrowth has to be kept under control or it will take over the world. The way ours is dealt with now is very much better than when the massive cut back was done a few years ago. Hi, Martine. Ten kilos already! I've tried a few blackberries but they've all been disgustingly sour, despite looking ripe, so I'll leave them a bit longer before going out to pick any. They are nice and plump though. Hello Lyn - I hope you find some good blackberries in time. I would think there's still time for them to swell, isn't there? Hello Dartford Warbler. I'm not sure this cut is as bad as 'vandalising' - though I really can't understand how the leaves in the crook got taken. There was what I think was a Meadow Brown close to the Gatekeeper but the picture I took of them in the same frame made them look too distant to be of interest. Hello Paul - I think the issue of hedgerow care is coming more to the fore. I have mixed feelings about leaving the wider ones be. I have no car and would like to be able to walk from place to place without being run over on busy roads. That means at least part of the verge needs to be trimmed for the benefit of long-distance pedestrians. Hello Down by the Sea - Yes, do do a tree following post! Your tree is a specially interesting one. Hi Donna. It looks as if this post has given a little nudge to several tree followers. I look forward to putting links here.